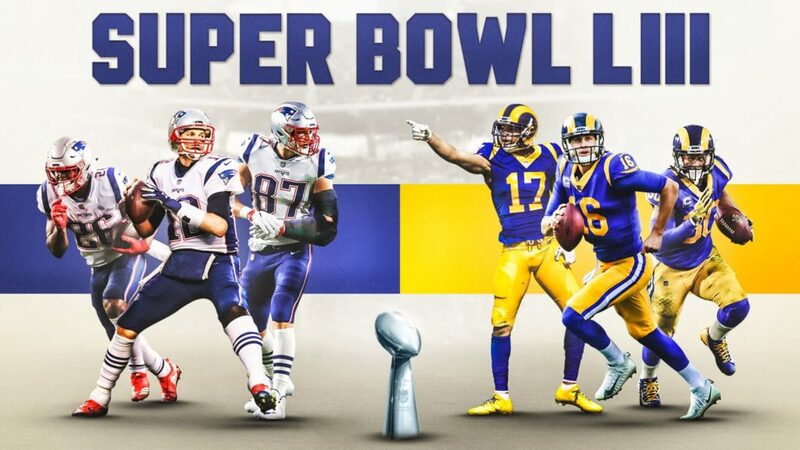 After breaking a two-decade run of Los Angeles not having an NFL franchise, the Los Angeles Rams made the most of their 2016 comeback to the city by making it to the 2019 Super Bowl. They’d left the city in 1980 to nearby Anaheim before moving farther out east to St. Louis, Missouri in 1995. But as the Rams gear up for the Super Bowl LIII game in Atlanta, Georgia on Sunday, February 3 against the New England Patriots—the same team they played against in their last 2002 Super Bowl appearance—many in Los Angeles made sure to let the team know that they had strong support cheering them on at home. A week before the Super Bowl weekend, Rams fans showed up at the LA Stadium at Hollywood Park—the site of the team’s home stadium in 2020—for a send-off rally for the team which included music, trivia, cheers, and appearances by second-year coach Sean McVay and Rams kicker Greg Zuerlein. “Make no mistake about it. Got a lot of respect for the Patriots, but we’re going there to get this last check,” said McVay, the youngest head coach in modern NFL history. Quarterback Jared Goff and running back Todd Gurley also let fans know that they were ready to bring the Lombardi Trophy back to Los Angeles. In Inglewood, the famous Randy’s Donuts temporarily turned into “LA Rams Donuts” as it transformed its iconic 33-foot donut sign, which can often be seen by those flying in and out of LAX, into a bright yellow donut donning the team’s name and colors, along with a Nike swoosh. Famous LA hot dog stand Pink’s, also flaunted their support for the LA team by adding some blue and gold to their iconic pink exterior. “Pink’s Turns Blue & Gold For the Rams!! !” read a banner in front of the stand. As fans and business prepped for the game, so did celebrities including Fil-Am artist Apl.de.ap of the Black Eyed Peas. Fil-Am Tarsier Records owner Chris Lopez, also known by his producer name DJ Moophs, was in town for ahead of the Grammys with Filipino singer Iñigo Pascual, but was excited to have the Rams playing the big game. “It’s exciting to be back in LA not only for Grammys week, but to see the LA Rams take home the title!” said Lopez who is also the son of ABS-CBN Global COO Raffy Lopez. Nelson Perlas, a Fil-Am from Anaheim who owns The Card Pavilion in nearby Santa Ana, said that there has been more interest in the shop for LA Rams cards and memorabilia in the last couple of weeks leading up to Super Bowl Sunday from both new and longtime fans alike. He himself has been a longtime fan. The first NFL game he saw live was back in 1994, the last season the Rams played in Southern California at the Anaheim Stadium when the team was hosting the Los Angeles Raiders in a pre-season game. He remained a fan when the Rams moved to St. Louis and continued to cheer them on as they found success in the following five seasons that included a Super Bowl win in 2000. So when the Rams announced they’d be coming back to Los Angeles in 2016, he immediately purchased season seats. In East Hollywood, Fil-Am resident Elson Trinidad—like many others—said he’s been paying attention to 24-year quarterback Jared Goff. Having sparked a new interest in the game after the Rams came back, Trinidad said his first NFL game was in November 2016 which was also the first game Goff had in the league. “He’s the first real LA Rams star of this era,” said Trinidad, referring to the fact that Goff has only played in LA and not in St. Louis. But Trinidad won’t be wearing any other current players’ jerseys. 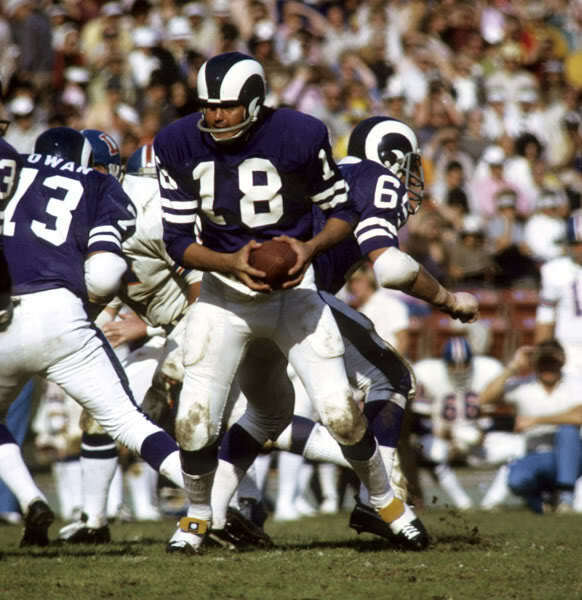 Instead, he’s prepared to don his Roman Gabriel #18 jersey to honor the retired player who was the first Fil-Am in the NFL, and who played for the Rams from 1962-1972. Trinidad was just a toddler back when Gabriel was on the field, but remembers his parents always talking about Gabriel and how he was Filipino. “I was too young to know about ethnic identity back then, but when I got older, it was great to know that a Filipino American like me was one of the greatest LA Rams players of all time. Those things mean a lot to us in terms of representation,” said Trinidad. Wearing the jersey, he said, symbolizes not only Rams pride or Los Angeles pride, but Fil-Am pride. “Honestly, I hope one day soon we’ll have another Filipino American play for the Rams,” said Trinidad. 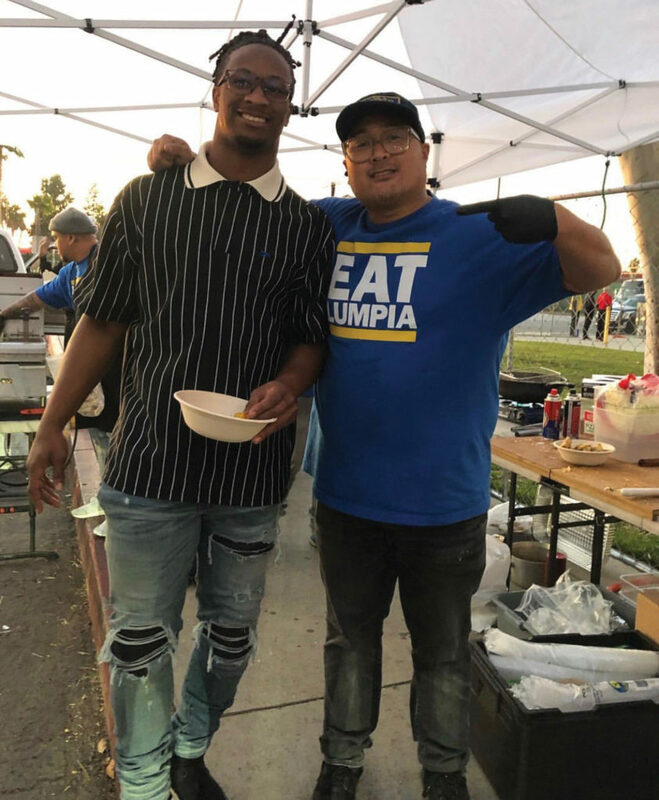 But while Gabriel has long been retired, the close connection between Filipinos and the LA Rams apparently still lives on in the form of food. 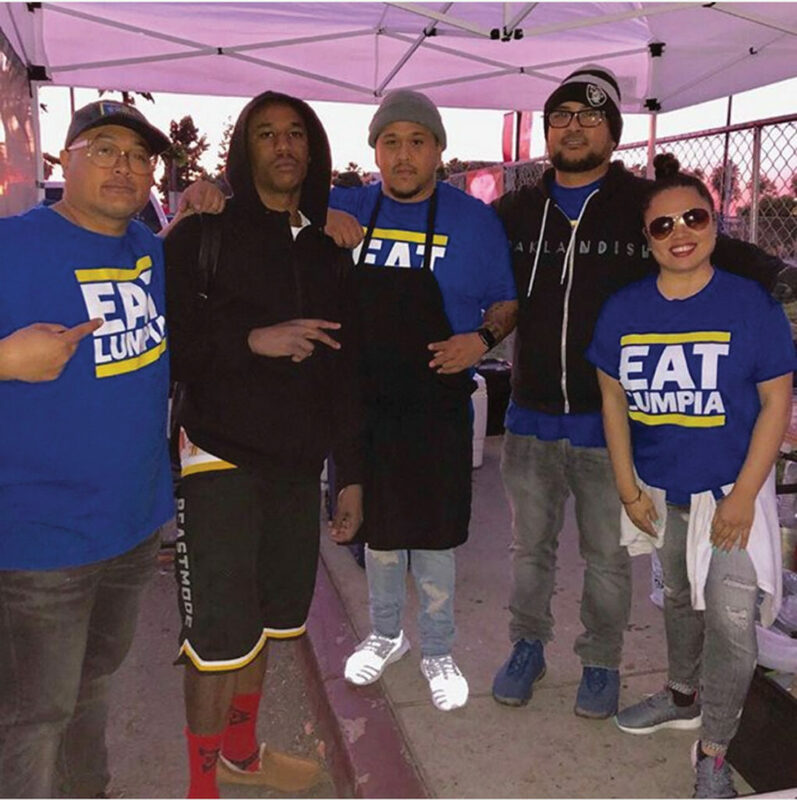 Alex Retodo, owner of The Lumpia Company in Oakland, revealed a well-known fact about Rams cornerback Marcus Peters’ love for Filipino lumpia. Fans of Peters may be aware of the story of how Peters almost burned down his cousin Marshawn Lynch’s kitchen when attempting to cook lumpia. “He loves lumpia so much,” Retodo told the Asian Journal, adding that Peters chose the Filipino dish when it was his turn to feed the team. Retodo, who recently fed the whole Rams team and organization during their last game of the season against the San Francisco 49ers, even teamed up with Peters in coming up with their own unique flavor that fused Filipino and Creole soul food. Inside the lumpia wrappers were fried chicken skin, diced whole chicken, corn, mashed potatoes, mac and cheese, and green beans. “Roll it tight just like tita taught me, dip it in gravy, then smother it in Louisiana hot sauce,” said Retodo. Super Bowl LIII will take place on Sunday, February 3. Kickoff time is scheduled for 6:30 p.m. ET.